Cover Description: Booster Gold, Huntress, and Superman combat the Royal Flush Gang. 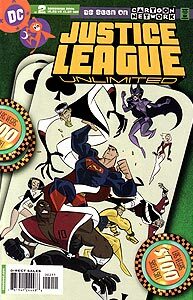 Issue Notes: This series is based on the events and characters depicted in Cartoon Network's Justice League Unlimited television series. Though these characters and events are similar to their comic book counterparts in the Justice League, there are varied and noticeable differences. Booster Gold is playing 5-card draw poker with his Justice League teammates Flash, Huntress, Steel, and Superman in the Justice League satellite Watchtower. Future panels will indicate that this is Booster's first Justice League poker game. Booster Gold accuses Superman of cheating at cards. You shouldn't tug on Superman's cape, but you also shouldn't accuse him of cheating at cards. The poker game is interrupted when the Royal Flush Gang attacks a Las Vegas casino. In this panel, King is quoting lyrics from the 1978 Kenny Rogers song, "The Gambler." In order to distract the Justice League while the Royal Flush Gang makes its getaway, King knocks a giant sword off of the exterior of the Casino Avalon. (There is no such hotel in the "real" world.) Avalon is the source of the sword Excalibur of Arthurian legend. Superman places the falling sword into a rock outside the Cro-Magnon Hotel & Casino. (Again, there is no such hotel in the "real" Las Vegas.) Placing the sword in the stone is another reference to Arthurian legend, and Cro-Magnon man was an early ancestor of modern man, living in caves during the Stone Age. Queen's line is a pun on a quote from the 1981 Mel Brooks' movie The History of the World: Part 1, "It's good to be the king!" Booster stands alone against Ten, the most powerful member of the Royal Flush Gang. 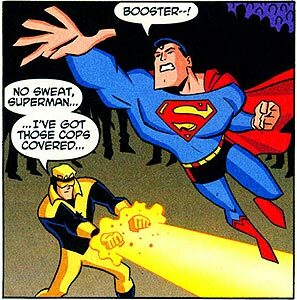 When Booster Gold joined the Justice League in familiar DC Universe continuity (in Justice League #4), he earned his spot on the team by overcoming Ten. The giant cowboy sign Superman wields in this panel (in a wanton display of blatantly capricious property damage) is from a "real" Las Vagas hotel. Vegas Vic is a 40-ft sign built to advertise the Pioneer Club Casino in 1951. The sign has been restored and still stands on Fremont Street (at least until Superman destroyed it to crush Ten).